BRIGHTON PARK — Violence around the neighborhood has made Carmen Castillo's daughter afraid to play in the snow. 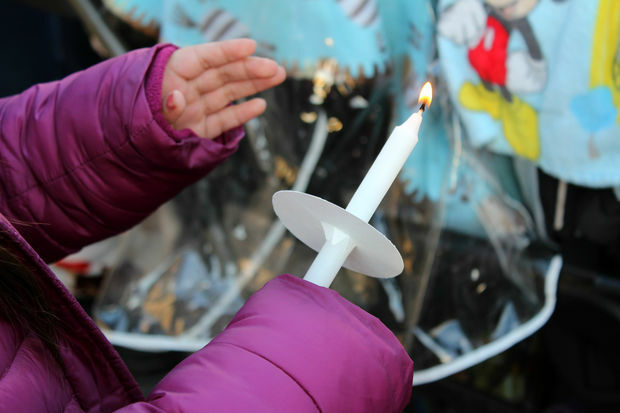 "She doesn't want to make a snowman, because she's afraid," Castillo said, standing alongside dozens of Brighton Park residents Thursday afternoon holding candles near Shields Elementary — just feet away from the intersection where a gang shooting last week killed two people and seriously wounded two others. The vigil represented a call for peace in the neighborhood, a movement to transform Brighton Park into a place where families feel safe again. "The reason that we're here today is because we are tired," said Marcos Ceniceros, community organizer with the Brighton Park Neighborhood Council. "We are frustrated with the senseless violence happening in our communities all across the city but also here." Ceniceros said preventing violence in neighborhoods will require much more than putting additional police officers on the streets. "We have innocent lives that are being taken and for no reason at all," said Anita Caballero, president of the Brighton Park Neighborhood Council. "We want our neighborhoods back." State leaders must invest in schools like Shields Elementary and fight for students, Caballero said. "We don't have the money we need for our schools," Caballero said. "That's why there are so many dropouts. That's why they're out there, because we don't have the resources we need."